Boulder, Colo., USA: Rare earth elements have become increasingly important for advanced technologies, from cell phones to renewable energy to defense systems. Mineral resources hosted in heavy mineral sand deposits are especially attractive because they can be recovered using well-established mechanical methods, making extraction, processing, and remediation relatively simple. In their study just published online in the Geological Society of America Bulletin, A.K. 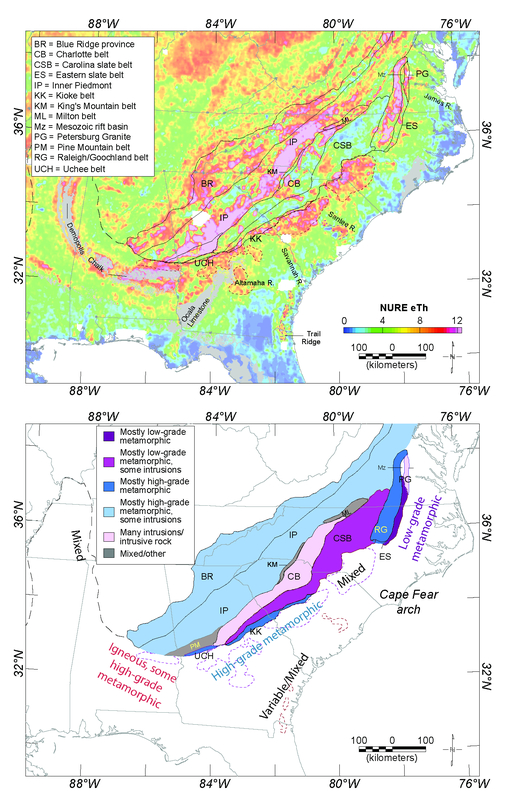 Shah and colleagues examine rare earth mineral resource potential within heavy mineral sands in the southeastern United States. Using geophysical and geochemical data that cover this very wide region, the team mapped the areas most likely to host accumulations of these minerals. Additionally, their analyses of co-minerals provide constraints on broad sedimentary provenance. These constraints suggest that a large percentage of the heavy mineral sands are derived from a relatively small part of the Piedmont province via coastal processes during Atlantic opening, and that a much smaller amount of heavy mineral sands are delivered via rivers and streams. A.K. Shah et al., U.S. Geological Survey, DFC MS 964, Box 25046, Denver, Colorado 80225, USA, ashah@usgs.gov, doi: 10.1130/B31481.1. GSA BULLETIN articles published ahead of print are online at http://gsabulletin.gsapubs.org/content/early/recent. Representatives of the media may obtain complimentary copies of articles by contacting Kea Giles. Sign up for pre-issue publication e-alerts at http://www.gsapubs.org/cgi/alerts for first access to new content. Top: National Uranium Resource Evaluation (NURE) radiometric equivalent Th (eTh; background) shows high values in parts of the Atlantic Coastal Plain inferred to contain elevated monazite and xenotime (red outlines); grayed areas represent carbonate rocks (also associated with eTh highs). Black lines delineate belts of the Piedmont and Blue Ridge Provinces. Bottom: Belts of the Piedmont and Blue Ridge colored according to rock type. Heavy mineral sands in the Atlantic Coastal Plain show regional compositional variations that suggest they were derived from specific rock types. These rock types correspond to Piedmont or Blue Ridge units adjacent to Atlantic Coastal Plain sediments. Dashed shapes delineate areas believed to contain elevated monazite and xenotime concentrations. A larger version is available.